William Henry "Bill" Fesselmeyer (26 December 1947 – 14 September 1984), also known in the Society for Creative Anachronism as Baron William Coeur du Boeuf, was a founder and senior member of the Des Moines-area chapter of the SCA and was responsible for introducing his friend Donald Brown to fantasy role-playing games. Brown credits Fesselmeyer as having the idea for a computerized FRP game, and it was at his encouragement that Brown created Eamon. John Nelson in the Eamon Adventurer's Log describes Fesselmeyer as the "Grandfather of Eamon". Dungeons & Dragons, the fantasy-themed role-playing game by Gary Gygax and Dave Arneson, had been released in 1974, and at some point over the following three years Bill began to play the game and share it with his friends, including Donald Brown. After Brown got his first Apple II computer in late 1977, Bill suggested to him that he should make a computerized version of D&D for the Apple. Bill and his wife Sherry Lynn (May) Fesselmeyer founded the Des Moines chapter of the SCA in 1978. The chapter was recognized by the SCA as a Shire of the Middle Kingdom in October 1982, and became a barony of the Kingdom of Calontir in July 1984. The name chosen for the barony was Coeur d'Ennui, French for "heart of boredom". The Fesselmeyers themselves assumed the names William Coeur du Boeuf (in English, "Beef Heart") and Rosamund Coeur de Boeuf. 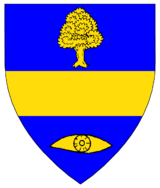 Bill's heraldic device was a pun on his surname, blazoned as "a fess between an elm tree and an eye, all or"—fess, elm and eye, or. On Friday, 14 September 1984, Bill, Sherry, and fellow SCA members Beth Elaine Nugteren and Sheri Lee Zemke were driving south to an SCA coronation in St. Louis when a northbound car from Missouri swerved over the center line and into their path. The cars collided head-on and the Fesselmeyers and their two friends were killed, as was one person in the other vehicle, Pamela Jo Keithly. (A second individual in the car, Michael Patrick Tannahill, was badly injured but survived.) The crash occurred around 10:30PM on US Highway 218 about eight miles south of Mount Pleasant, Iowa. A joint funeral service for the Fesselmeyers was held in Des Moines and was attended by friends from the SCA wearing full dress armor. The couple was buried, Bill in his battle armor, at Floral Hills Cemetery in Kansas City, Missouri. John Nelson reported the deaths in the October 1984 issue of the Eamon Adventurer's Log, asking players to "doff their helmets, and dedicate a moment of silence for the person responsible for their Wonderful World of Eamon."